Think Instagram filters are good, but you could have done better? Here’s your chance. Just about ever photo app I have covered has some level of filter enhancements available to apply to your iPhone photos. 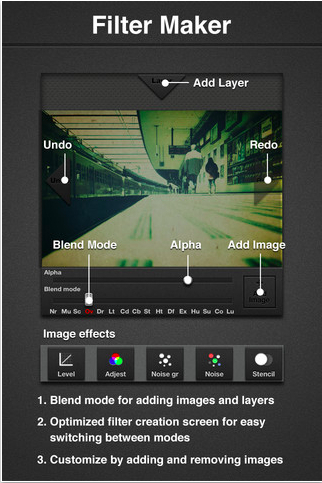 Many filters have a common name from one app to the next but act slightly differently. The most common know filtered photos are those coming out of Instragram with it’s group of offerings. No matter which app, I find myself wanting a bit more of some part of a filter to get the effect on the particular photo I’m going after. “That filter would be perfect if it was married with this other filter”. To get around this, a few apps even allow the application of multiple filters one after another. Piling filters is not what I’m talking about, but it’s better than not. The app Pro Filter is giving us a chance to create and share our own filters. With Layers, there are 18 effects and 16 blends to mix and match in an attempt to create the filter effect envisioned for the photo. Since the concept is new to a lot of folks but there still may be a desire to create, a built-in ‘How to’ is included. When done, Pro Filter supports sharing the photo (you can also share the photo with the filter) out through an email, Facebook, Twitter and Flickr. Getting started, it isn’t a bad idea to look over what others have created to get a feel for a direction you may want to go.